A large fire broke out in a Dubai high-rise early Friday local time, sending flaming debris raining below and prompting an evacuation, authorities said. 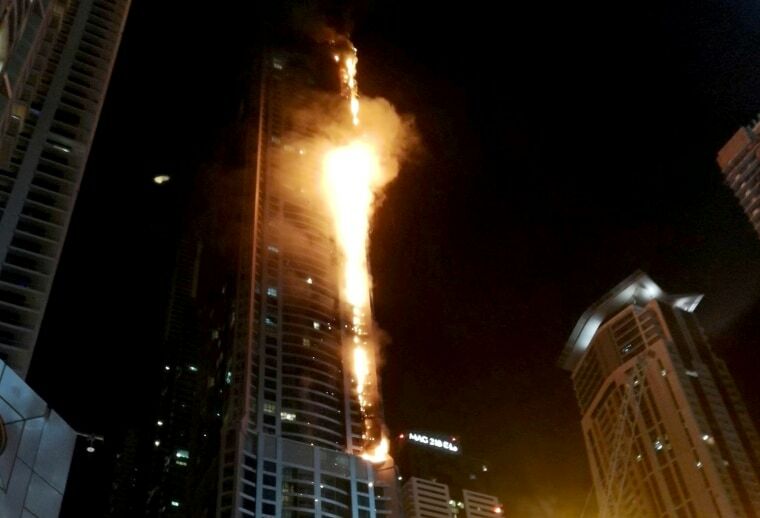 The building known as the Torch Tower was evacuated safely and there were no immediate reports of injuries, the government of Dubai’s media office said on Twitter. Video showed flames on several floors up the side of the 79-story tower, which is one of the world’s tallest residential buildings. An Associated Press journalist near the scene of the blaze said more than 40 floors of the high-rise tower appeared to be engulfed in flames on one side of the building. Residents of the building could be seen crying with several saying the fire broke just after 1 a.m. (5 p.m. Thursday ET). The media office said shortly before 4 a.m. that the fire was brought under control and "cooling operations are underway." Officials told the AP they were working on providing shelter for those affected. Ltn. Col. Ali Al Mutawa with Dubai Civil Defense said that, unlike the catastrophic fire at Grenfell Tower in London that killed several dozen people, various measures prevented the spread of Friday's fire in Dubai. In particular, he cited stairwell doors "that can resist direct flame for three hours," as well as side sprinklers on the exterior of the building that "prevent the fire to come from outside to inside." "We have an annual fire drill in every tower and every building," he added. "By law it is mandatory to conduct a fire exercise, a fire drill that they have to do as close to reality. So all the people have to leave and all the systems have to be evacuated." Jesse Byrd, an American who lives on the 18th floor, said he received a phone call from his sister, who also lives in the building, at about 12:45 a.m. local time telling him of the fire. "I arrived at about 1:30 a.m. and watched the building burn from about an alleyway away for roughly one hour with the crowd," he said. "The fire from what we could see went from worse to slightly better to noticeably worse before we left at 3 a.m. to find lodging." Byrd said he was allowed to return to retrieve his belongings on Friday and found his apartment to be as he left it. His sister, who lives on the 43rd floor, was not allowed to return to her apartment, he added. The Torch Tower also caught fire in February of 2015. A huge fire ripped through another Dubai skyscraper, the 63-floor luxury hotel the Address Downtown hotel, on New Year’s Eve as the years changed from 2015 to 2016. Fourteen people were injured in that fire.